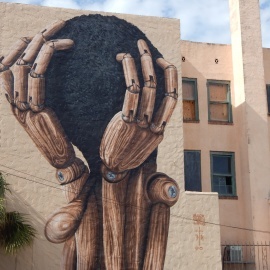 St. Petersburg is the arts capital of the Tampa Bay area, boasting almost 100 galleries and performing arts centers mostly concentrated in the Downtown and Central Arts districts. People come from all over the world and pay to see works by Salvador Dali, Dale Chihuly and Georgia O’Keefe. But what makes the downtown core and Central Avenue really special is the free art everyone can see gloriously painted on the walls of the buildings; there are over 500 murals painted by dozens of local and international mural artists whose impressive work comes in all shapes and sizes. The best way to see it is on a mural tour that brings you up close to the artwork that is larger than life. 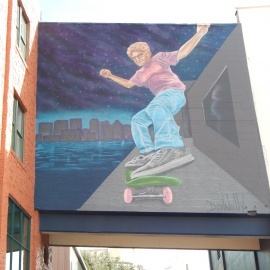 A great mural tour is conducted by the Florida CraftArt gallery and artist lofts located on Central Avenue. The tour is guided and on the day I took it, the guide was Diane Shelly, former artistic director for Florida Craft Art, who said there are three techniques used to paint them. 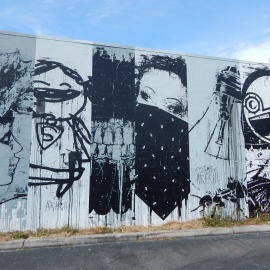 Artists using the “Grid” technique draw the images to scale first and paint once the entire mural is drawn on the wall. The “Projection” method allows the artist to project the image onto the wall at night. and the “Freehand” method is used by artists who just paint from the image in their mind. Many of these detailed murals take days to create using landscape trucks and special spray paint by artists who must be able to paint on a wall with the perspective of seeing the artwork from a distance of 20 feet away. There are few rules about the content of the murals, but logos and words are rarely used. 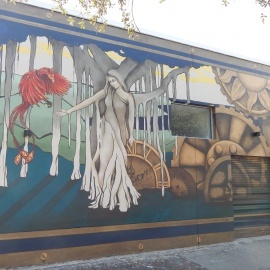 The walking tour covers almost four square blocks of the Central Arts District in St. Petersburg and over 50 murals, each with its own story. Many are located in alleys and on service roads behind buildings, with even dumpsters and electric utility boxes given life from an artist’s brush. Murals seem to be everywhere, and some start outside and then find their ways into the businesses themselves. The walls inside Angelo's Pizza are covered with the same themes found on the walls outside, while St Petersburg Brewing Company boasts a façade mural complete with hops leaves, a nod to what’s taking place inside. 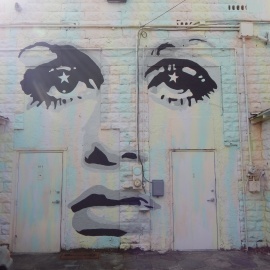 Among the stand out murals in St. Petersburg is the face of 1970s supermodel Twiggy, located off the alley behind the building that is home to The Hyppo St. Petersburg and The Cider Press Café. At first it seems to be painted on a plain white wall, but closer inspection reveals an intricate background painted to resemble tree bark in rainbow colors. Lizard King is a tribute to Jim Morrison of the Doors, who had relatives living in St. Petersburg. Shark Toof, behind the State Theatre and near URBAN Creamery is one of the more amusing murals. A giant shark, jaws open wide, swims toward an actual gated doorway that resembles a shark cage. The cage door is an actual working door of the building. Step inside to get one of the best photo ops in the city. Another melds the letters of St. Pete with those of Tampa to create a stunning image and message of unity across the bay. Murals on the walls around the Morean Arts Center complex include “Life Reimagined,” depicting a drab working life that bursts into color upon retirement. 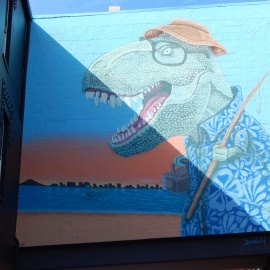 A fun-loving dinosaur and skateboarding senior citizen can also be seen. 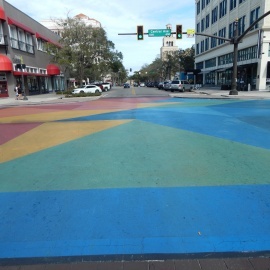 On the intersection of 5th Street and Central Avenue, near the Iberian Rooster and Il Ritorno, a color block mural covers the entire road surface. It was painted by local artists and volunteers including Mayor Rick Kriseman, a longtime supporter of the arts community in St Petersburg. 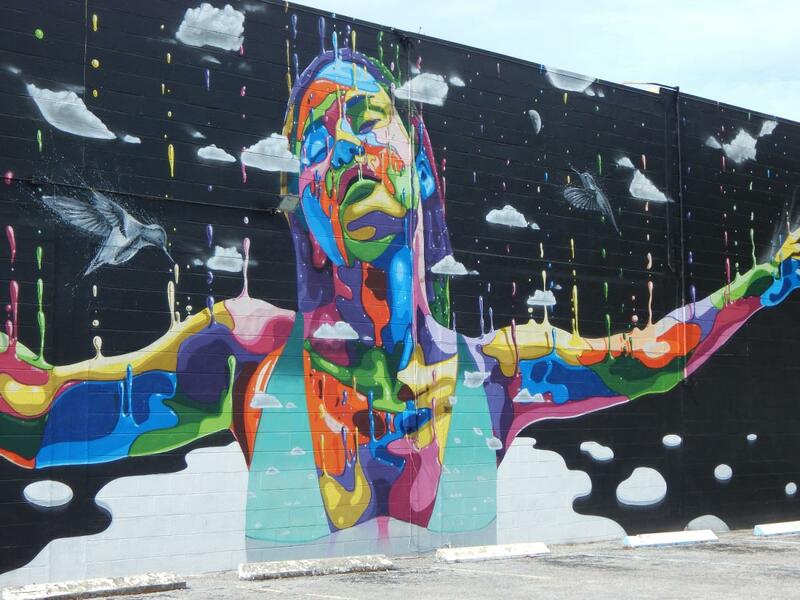 Every year St. Petersburg hosts the Shine Mural Festival that attracts artists from all over the world, and has created 35 of the most dramatic murals in the city. Many of them can be seen in the Edge and Grand Central districts. The side of Urban Brew and BBQ is almost as excellent as the food, with a train mural depicting the journey of owner Andy Salyards. China Finders on Central Avenue has an Alice in Wonderland Mural complete with the mad hatter and what else. . . a tea party! One mural located a little off the beaten path is called “Against Monsanto”. It is a political statement depicting humanoid robots in a field of flowers. 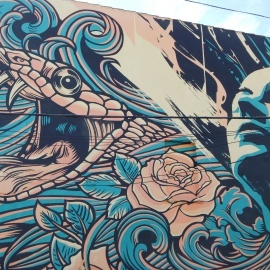 There are so many of these beautiful murals in St. Petersburg, you could easily spend an entire day roaming Central Avenue and its surrounding streets. Grab a mural map and discover them while sampling the local cafes, breweries and shops: you can nourish your body and feed your soul at the same time. For more things to do and the best restaurants and bars in Pinellas County check out 727area. Register for updates sent to your mobile phone. Best of all, it’s free!